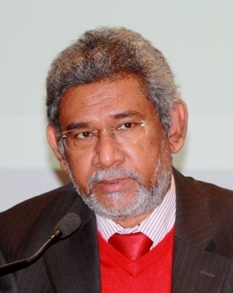 President Mahinda Rajapaksa yesterday for the first time openly criticised his former Ambassador to the UN in Geneva Dayan Jayatillake, saying he was making political statements and claiming he was now working for a non-Governmental organisation. Responding to a question by the Al Jazeera Interviewer about the fact that his former Ambassador had strongly criticised the Government’s actions in Weliweriya where the armed forces are accused of shooting unarmed civilians, the President accused Jayatillaka of making statements for political reasons. “But he was your Ambassador, Mr. President,” the Al Jazeera reporter said. The Al Jazeera reporter was quoting from Jayatilleka’s comment on the shootings at Weliweriya in which he noted: “The obvious observations will be, if this is how the State authorities treat unarmed Sinhalese, largely Buddhist civilian men, women and children who are protesting against polluted water, how must that state have treated the Tamils in the closing stages of the war?” Dr. Jayatilleka told Colombo Telegraph that the President’s assertion or allegation was completely and utterly without foundation in fact. “Doubtless the President has been grossly misinformed,” he said. The former Ambassador said the last time he was a member of a NGO was three decades ago, when he was a member of the now defunct Movement for Inter-Racial Justice and Equality in Sri Lanka. “I can state unambiguously and categorically that I am not a member of any NGO, large or small, international or local,” Jayatilleka told Colombo Telegraph, adding, “I would also like to know which NGO I am supposed to belong to”.